Fine area rugs require a unique and careful rug cleaning process. 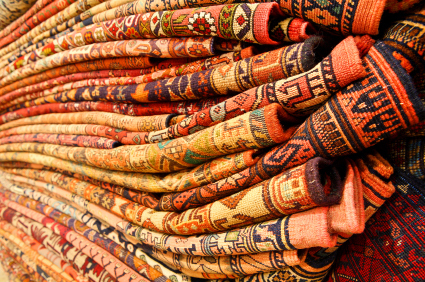 They need special treatment by skilled craftsmen with experience in cleaning all varieties of fine rugs including delicate antique, Oriental and heirloom rugs. When it comes time to clean your prized area rug, use ABC Rug Cleaning and Repair for their quality results and close attention to fine area rug detail. At ABC Rug Cleaning and Repair, we treat you fine area rug using a unique cleaning process to ensure quality results. Our rug cleaning experts in NYC know the different variations of cleaning methods for each specific rug (hand-made vs. synthetic, knotted vs. weaved). We start the cleaning process with a thorough inspection to determine damages and threats such as age, wear and fiber composition. We then work with you to determine the exact cleaning process required for your area rug. We perform all rug cleaning in NYC in specially-designed facilities. To clean the rug, we start by vacuuming and beating out both the surface and embedded dirt and pre-treat in a natural conditioning solution. Our experts then gently lift away stains and shampoo the rug thoroughly. Our cleansing process releases all tough stains and embedded dirt while protecting and enhancing its original beauty. To finish, we groom the entire rug and then let it dry completely in our temperature controlled room. Trust ABC Rug Cleaning and Repair to refresh and clean your fine area rug. When we finish our job, you will enjoy a new clean to your precious antique.